Parenting Experts & Animal Experts Unite! 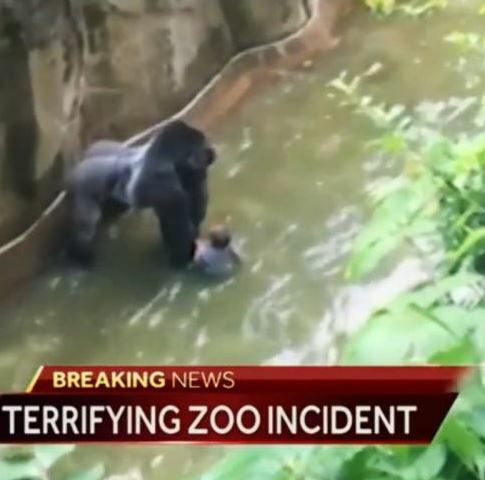 When I learned of the incident at the Cincinnati Zoo, I was deeply saddened. For everyone involved! For the child who, in his innocence, wanted to play with or swim with the gorilla and ended up in fear of him. For the mother who endured the terror that her child might be gravely injured from the fall and/or killed by the gorilla. For the bystanders who felt powerless to help the child. For the zookeepers who, though trained, were forced into action they hoped to never take. For the other gorillas who witnessed the tragedy of their friend/mate being killed. And for every parent who felt “that could have been my child”. As I watched the video I was mesmerized. The child was in awe of the huge gorilla. The gorilla was intrigued by the boy. Neither knew what to do with the other. Bystanders didn’t know what to do. There was too much at risk to hesitate too long and too much at stake to act too quickly. The gorilla made the ultimate decision easier when he became excited (agitated as the zoo explains his animal behavior.) In his excitement, he chose not to follow the commands of the zookeepers. He chose to remain with his new discovery and he didn’t seem interested in sharing! What some saw as “protecting” the boy, I saw as keeping the new discovery to himself. There is a huge difference in intention and energy. As I listened to the video, I was listening for voices in prayer. And I heard it! At least one bystander recognizing we are NEVER powerless, responded in the best possible way -with prayer! She was asking God to protect the child. It was perfect! I was pleased to hear the mother, in her desperation, remaining somewhat calm and trying to let her son know she was there! Animal experts determined that the gorilla was not going to release the boy with ease and grace. His desire to hold onto his special new discovery was strong enough to create an unsafe situation for the child and the keepers. Harambe, the gorilla, had no idea this was a human boy who needed to be handled gently to keep him safe from injury. His animal instincts naturally kicked in and he responded by backing away from his keepers and making sure his discovery remained in his possession. The decision to save the child was absolutely the right and best decision. And given this circumstance, there seemed only one way to save him. We simply cannot fault the zookeepers for saving the child in what appears to all animal experts as the only viable option Harambe gave them. Harambe was not being maternal and comforting the child. He was being possessive. We can only guess at what would have happened if the situation had continued longer. Over the next few days, I was more deeply saddened. Not by the situation itself as I had already changed my focus to the positives that came from this event and I was so happy the child was not seriously injured. The child does not need to be “scarred for life” because of this incident. It can be handled well and he can heal gracefully from it. What saddened me was the outrage from thousands of others who were NOT there but who decided they could and should judge and condemn the parents and the zookeepers. Suddenly, everyone is a parenting expert and a wild animal expert. Suddenly, there is blame to assign and all those NOT witness to it are assigning the blame. I read posts inciting radical racism as well as posts calling for the mutilation of the parents. I read blogs and posts about how the parents are to blame and should be harshly punished. I’ve read blogs and posts about how zoo’s in general are to blame. I see comments about how the parents should have to pay for everything from the enclosure redesign to paying for the death of Harambe. I’m not going to debate whether we should have zoo’s. I’m not going to debate whether the parents are good enough, watchful enough, smart enough, or … enough! I’m not going to debate whether the enclosure (safe for 30 years) was good enough! I didn’t witness the incident so I cannot judge this incident in any way. However, I can be ever so grateful the child is alive and well. I can be ever so grateful no adults went into the enclosure which certainly would have created a very different outcome! And… I am ever so mindful that for the Grace of God – that was not my child or grandchild. Because we cannot see their every move nor know their every thought nor anticipate their every action. Accidents happen. Emergency rooms are filled with the results of accidents and incidents. Thousands of parents can speak to the angst of having their child MIA while in a mall, shopping center, public gathering, etc. I read another story from someone who had a very similar incident happen with her son falling into a zoo enclosure. The difference for her? Everyone was helpful. Everyone wanted to make certain that she, her son, and the guy who saved him, were safe and “alright”! Everyone cared about them! Everyone cared enough to make sure they were okay after the incident. 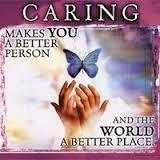 People cared… Everyone CARED enough! When did we stop caring enough?